Near-curve gas prices moved down yesterday as the Kollsnes processing plant in Norway returned online following a planned outage. The Corrib gas field in Ireland also returned following numerous delays which reduced UK exports, further weighing on the prompt. Movement at the back of the curve was more subdued as stronger coal offered resistance to the bears. 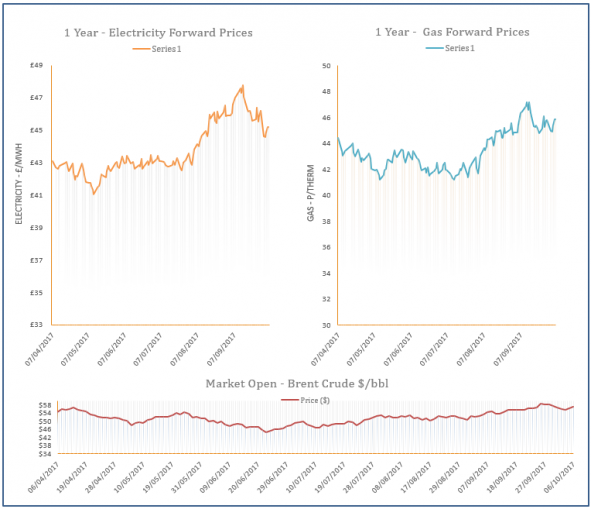 A rise in temperature forecasts for the remainder of October effected European gas prices on Tuesday. Short - term maturities posted the biggest losses and shrugged off an ongoing cut in Norwegian gas supply due to planned maintenance work. The UK system was heavily oversupplied throughout the session, leading to a plunge in NBP day-ahead prices. 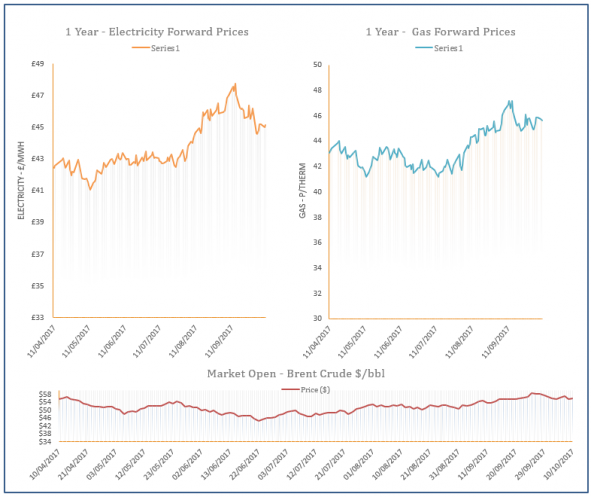 Gas prices on the near-curve moved higher ahead of scheduled maintenance work in Europe which will reduce flows into the UK. French nuclear supply also remains a factor as safety checks will limit available capacity, resulting in increased gas-fired generation. 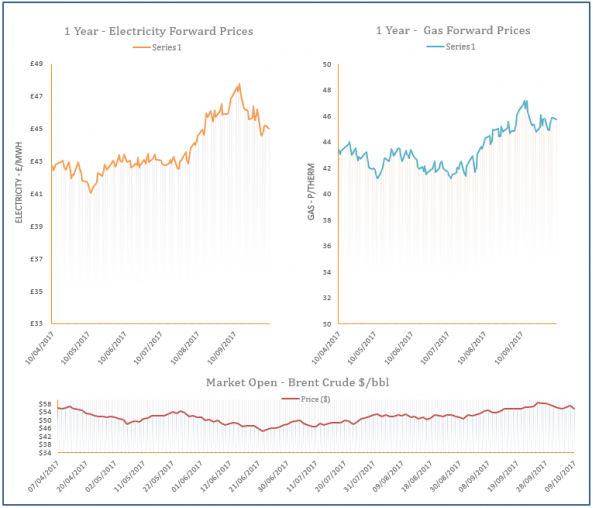 A rise in LNG prices also contributed to the gains, while there was little change on oil and coal markets. 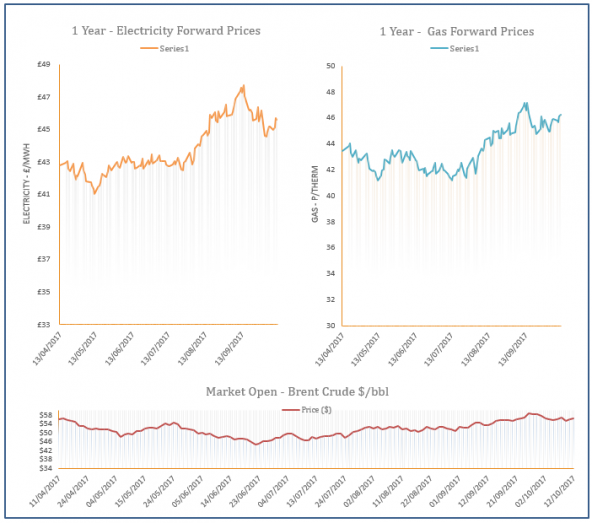 The ongoing outage at the Corrib gas field in Ireland continued to increase UK exports, providing support to the near-curve despite an oversupplied system. Planned maintenance in Norway is also scheduled for tomorrow and Wednesday, adding to the bullish sentiment. Further out, a weakening Pound was offset by a drop in coal prices, resulting in some losses. Planned outages in Norway will restrict imports between the 10-12th of October, while unplanned outages affected Heimdal and Entry Segal, helping to lift prices on Thursday. Oil prices also recorded further gains which supported the far-curve, while the Pound continued to weaken against the Euro.